Electrical panel covers are removed. 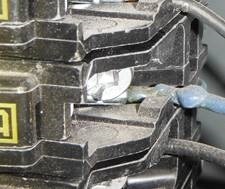 The blue wire is heating up due to a substandard wire type material that was used. Any redistribution or reproduction of part or all of the contents of this site in any form is prohibited. You may not, except with our express written permission, distribute or commercially exploit the content, or use it on any other website or in any type of printed format. Prices subject to change at any time. Please contact us for latest pricing information. Copyright © 2019 Zink Home Consultants. Powered by WordPress. Theme: Spacious by ThemeGrill.